My (Andrew’s) parents came to visit in May. We had a wonderful time! I am blessed to be able to say that my parents are probably the biggest supporters of our ministry (I am sure that Abby would say the same of hers). Not everyone has the blessing of their parents while in the missions field. I have friends whose parents are angry at their decision to follow God’s calling. I know missionaries whose parents have never come to visit. My heart and prayer goes out to those who press on without the support of their loved ones, but I thank God for not giving us this challenge. Having my parents in town gave us an excuse to enjoy some of the wonderful places of Kenya. I have been blessed to enjoy Africa’s scenery and wildlife on a number of occasions, so it was nice for me to share that with Abby and family. After giving my parents time to rest and getting Austin, our summer intern, connected with the missions group he was going to work with, we begin our journey home on the scenic route. Our fist stop was Naivasha. We visited Hellsgate National Park, which gets its name from the geothermal activity that releases plumes of steam into the sky. After viewing the wildlife in the coolness of the morning, we took a hike through the canyon. They said it was an easy hike, but we ended up having to do minor rock climbing through the ravines. The next day we took a boat ride on Lake Naivasha to see the hippos and walk among zebras, gazelles, wildebeest, giraffe, and more on Crescent Island. Next we visited Nakuru and Nakuru National Park. The scenery was absolutely gorgeous! Some of the wildlife highlights were thousands of flamingoes, rhinos, and hyenas. After Nakuru, we made it to Nanyuki and put my parents to work. My dad used his construction background to help teach the property foreman the proper way to put up a fence (it was sent from the U.S. and different than what Kenyans are use to), and he also consulted on other building projects. The Daniels tried to recruit my parents to stay and help more :). It was great for my parents to see the wonderful place we live and meet all the great people. We also took trips to both the orphanages. Since they were here just before the tourist season, we were able to get a great rate at The Ark in Aberdere National Park. The lodge is located on a watering hole, so as the sun goes down spotlights come on and you can see the animals at night. There were lots of elephants, buffalo, warthogs, and various antelope. After dinner we watched a pack of hyenas chasing the buffalo trying to separate one from the herd. They ended up in the forest, but throughout the night you could hear the battle between the two groups, the infamous laughter of the hyenas and weakening moan of a defeated buffalo. In the morning my parents watched a hyena attack a bush buck. Abby and I stepped out of our room seconds too late to see the action but my dad caught it on video (including my mom’s cheers for the poor antelope to escape). One evening we visited the animal orphanage next to the Mount Kenya Safari Club. There you can feed and pet monkeys, ostriches, an impala, a giant tortoise, and many others. They have a zebroid (zebra/horse) and pygmy hippos. They also have a breeding/rehabilitation program to help save the bongo that has a population somewhere between only 100-200 alive today. Feeling that my parents could not leave Kenya without seeing a lion, we decided to stop by Sweetwaters game preserve on our way to Nairobi. The park has 52 lions, but after two days of looking we left defeated. We were blessed to see a cheetah (my favorite animal)! The park has a chimpanzee sanctuary which is always fun, and we got to see the Northern White Rhino which only 7 are known to be alive in the world. We arrived in Nairobi to meet Austin after his time ministering in a Somali dominated area. 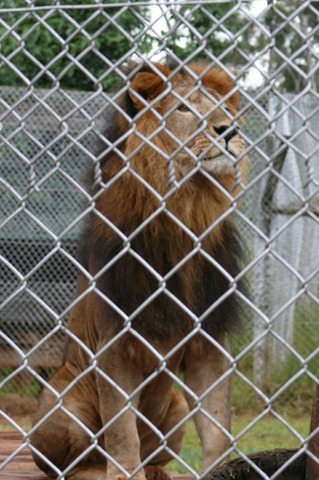 In a final attempt to see lions we visited the Nairobi animal orphanage. They have a number of lions, a few cheetahs, and a leopard. We completed seeing the “Big Five” (Lion, Leopard, elephant, buffalo, and rhino), and we even got to hold a baby lion and cheetah! There was also a zedonk (zebra/donkey). We stopped in at the Maasai market for curio shopping and then took my parents to the airport the next morning. I was sad to see my parents go but thankful for our time together! I hope my mom can sleep a little better now knowing our home and meeting the wonderful people that we live around. They have seen the great ministry that God has called us to. I look forward to seeing them in a year and a half, but know that God has so many things planned between now and then.